‘GZ Tales Vol One’ is a collection of 12 short stories that introduce readers to a new universe of characters. Inside a man saves a small town with only a guitar. A little girl has an imaginary friend that kills. Two heroes travel to the core of time and space. A tortured man in a wheelchair becomes a new superhero. All designed to take readers on an amazing journey. How does a man save a small town with only a guitar? How do two heroes travel to the core of space and time? All of these questions and more are answered in ‘GZ Tales Vol One’, and I’ve been lucky enough to be joined by its author David Wilde today. David, these short stories have such different directions, how did they come to life? It began as a swarm of information in my mind. I have hundreds of characters and they all want the spotlight. Were they all in your head already? You didn’t have to find any of them? They’ve been in my head for years. I used to get in trouble for drawing them in school when I was a kid. Drawing all of these characters sounds like a good reason to get into trouble to me! How did you know what do with each of these characters? Did you try and put them into experiences you’ve had in your life and see how that panned out? I try to add as much real and believable content as I can. Sometimes I pull from life experience. Mostly I research. What did you learn from turning this research into 12 stories? Giving characters believable lives is a deep issue. A life is so many fragments, it’s easy to miss some. Life really is just a bundle of fragments glued together, isn’t it? What did you think was the most important aspect to share with your readers about the fragments of life that you explore in these short stories? To take a journey and let your imagination be your guide. Let your imagination be your guide. I love that advice, it’s so poetic! And having fun with your imagination is always so much fun. Where did you find the greatest rewards from playing with your imagination? Giving my characters life and breath. Putting them into action and gaining the sense of accomplishment when finished. Has that sense accomplishment pushed you into a new set of short stories? Can you let the readers and I glimpse at your upcoming release schedule? I’m currently working on GZ Tales volume 3, my fourth novel and the second expansion to the board game. A new novel and a board game. You are going to have so much fun! But I’m intrigued to find out what you love so much about writing that you’d take time away from making new board games. It brings me joy and accomplishment. It shows my son what you can do when you never give up. How is this idea of never giving up reflected in your daily writing practice and techniques? Because I live with Multiple Sclerosis, it depends on the day. I aim to create every day. Writing at least a thousand words, drawing a couple pictures, or just laying out some guideline plans. And I can pretty much do this anywhere I can just sit. I love that you use your energy to approach your creative pursuits from all of these different angles. Because you are working on the ideas from multiple directions do you feel that you know the ending before you start writing in earnest? Or do the ends of the stories change as you start and keep writing? All of the above. I always have an idea of how it will end but the fine details get ironed out on the way. Are those fine details what you have in your head while you’re writing, or do you place your mind on other things? What features in your head while you write? An entire universe and yes that gets heavy at times. An entire universe would be incredibly heavy. But when you get tired of working with an entire universe you could always kick back and edit. Are you a keen editor? My wonderful wife is my very capable editor and proofreader. Past that, I’m a one-man band just building his brand. I love a writer with an author brand! Tell me all about it and what you’ve created so far. Galaxy Zento is definitely aimed to be its own brand. Characters are built with distinct and unique facets and points of view. While it’s difficult to be perfectly original in this day and age, I feel I succeed with most of them. I aim to take them and their adventures to several places like graphic novels and board games. Who knows where they can go from there? I’m not sure, but it sounds like it will be fun to find out! Do you feel that the way that you have approached your author brand and writing have to lead to a progression in your author voice? Absolutely. I find myself growing and evolving with every piece I write. I never know how that’s going to work out until I reflect back after finishing. When you reflect on the exciting writing and creative journey you’ve taken so far, what advice do you feel that you can impart to others? Hard work makes the world go round. Make it a point to collect that and any other advice you can from authors across the web. Follow it all and aim to learn something new about the craft every day. Before I let you return to learn an aspect of the writing craft today, I’d like to take a few minutes with you to unburden yourself of the weight of your universe and have a little fun with the quirkiness of this universe. One quirky thing I’d like your opinion on is lemons. Why is lemon juice made with artificial flavour, and dishwashing liquid made with real lemons? I have never tasted dishwashing liquid, nor have I washed my dishes with lemonade. This makes it difficult for me to provide a solid scientific point of view for this conundrum. I have to admit I have no plans for pursuing any definite results. I’ll just stick to making my own lemonade. I’m sure your lemonade tastes much better than that lemon flavoured dishwashing liquid any day! Keeping ourselves pondering about the wonders of the grocery store, why isn’t there mouse-flavoured cat food? I suppose when a pet food scientist is paid enough to taste mice that might be accomplished somehow. As I understand it, though, some things including mice do fall into the factory machines. So who knows? You know, every time someone says that there could be little mouse bits in factory machines the less I want to ever eat anything processed ever again. Ewww. We need to move away from gross stuff, so what is your zodiac sign? Cancer and I was born in the year of the Dog. The year of the Dog is always a good year. What is your best tip for authors? Winner! I think that is my favourite word suggestion ever. And can you follow that up now with your favourite line from GZ Tales Vol One, to reward and entice the readers to chase these tales today? *Laughs* Well, where else would it be! David, thanks so much for taking a little time with me today to have some fun while chatting about writing in your universe of ideas. Keep having all of that creative fun! Excited to read the book we discussed today? Find it here on Amazon: ‘GZ Tales Vol One ( ASIN: B00DNJWKU8 )‘. 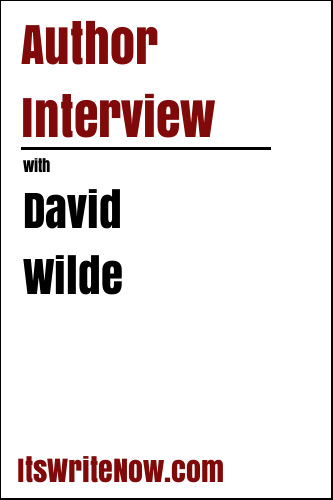 Want to find out more about David Wilde? Connect here!